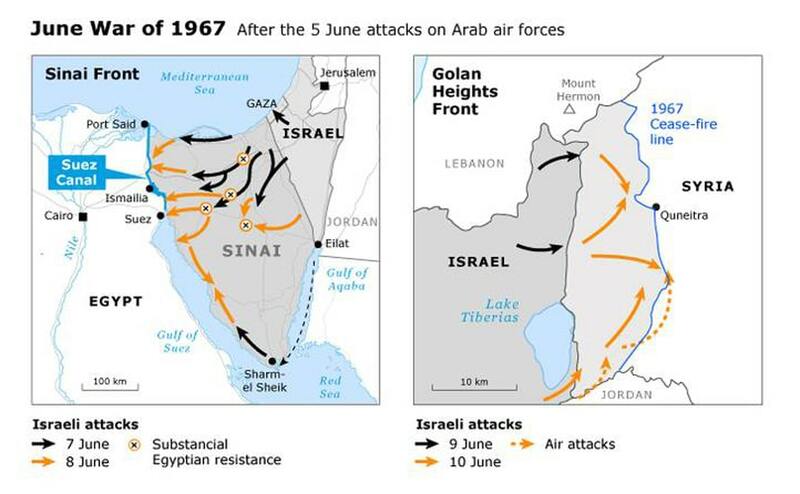 The most fundamental development in the relations between Israel and its Arab neighbours was the June War of 1967 (in the West known as the Six-Day War, from June 5-10). This war had far-reaching consequences for the balance of power in the region. It broke out in a context of heightened political tensions and military moves on both sides. Seen from the Israeli side, the war was an answer to the threat of the combined military might of Egypt, Syria and Jordan. Initially, in the period leading up to the war, the most direct threat had come from Syria. From its territory and from Jordan, raids by Palestinian Fatah militias into Israel had been encouraged and facilitated by Damascus. Furthermore, there was a running dispute over the use of water from the Jordan River between Israel and the other riparian states (Lebanon, Syria, Jordan). There had been sporadic shelling of Israeli villages and military positions by Syrian artillery from the Golan Heights in retaliation of Israeli provocations, followed by an air battle on 7 April 1967, in which the Israeli Air Force downed six fighter planes of the Syrian Air Force. 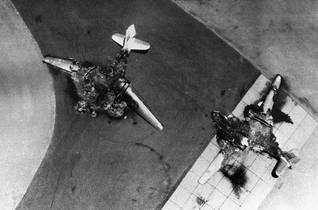 In Israel, the April 7 raid was widely criticized, among others by Moshe Dayan, at that time member of the Knesset for Rafi, a party which had split from the governing Mapai party. Dayan, who would be appointed Minister of Defence on 1 June 1967, understood that as a result of its excessive action against Syria, Israel was creating an unnecessary atmosphere of acute crisis. Egypt, Dayan guessed, would clearly feel provoked by such behaviour and would sooner or later want to show its muscles to its Arab friends, especially to Syria, with which it had recently become formally allied. Then on May 13, Moscow informed the Egyptian President Nasser that Israeli troops were ‘about to attack Syria’. The reason why this information – which was incorrect – was divulged by the Soviet Union has never been fully understood. It might have been meant as a further incentive for Nasser to take action. Whatever the reason for the Soviet Union’s actions, in the following days the Egyptian President took three steps of great importance in the dramatic course that would eventually lead to the June War. First of all, on May 16 he began to order a redeployment of some of his troops in Sinai. Secondly, on May 19 he asked the UN Secretary General U Thant to remove its peacekeeping force, the UN Emergency Force (UNEF), from the Sinai border with Israel. Thirdly, and considered most dangerous, on May 23 Nasser announced that Egypt would block the Straits of Tiran to Israeli shipping. 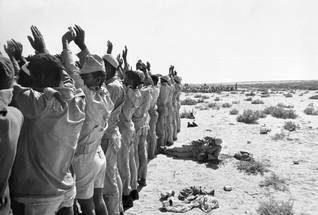 At first, the redeployment of Egyptian troops did not worry Israeli Prime Minister Levi Eshkol too much. He viewed the redeployment as related to an Israeli military parade to be held in Jerusalem a few days later. In his view it was a minor token of irritation on the Egyptian side. This also complied with Eshkol’s long term assessment – shared by the Americans – that Egypt would not and could not initiate a war within the next five years. Other Israeli observers saw the move at most as designed for public consumption and as token support for Syria, which until then had been left in the lurch by Cairo after suffering the April 7 air raid debacle. The second step in Nasser’s escalation, the request to U Thant regarding the UNEF, was initially of the same order and could be seen as a sign of Egyptian irritation. It still left the way open to let the UN troops operate from Israeli soil, but Israel immediately rebuffed U Thant’s request. As a result, Nasser’s move gained more serious and negative momentum. The third move, the closure of the Straits of Tiran to Israeli shipping, had an immediate effect on public opinion in Israel – more than it actually warranted. In military circles in Israel, as might be expected, tensions rose. Chief of staff Yitzhak Rabin went so far as to deem this an issue of ‘to be or not to be’ for Israel. Meanwhile, another critical development had already begun to dominate the mindset of the Israeli leadership, affecting their conventional military threat assessment. During a visit by Eshkol to Israeli troops under the Southern Command, General Aharon Yarif, the chief of the army intelligence, had given the Prime Minister a briefing, in summary announcing that he and his staff had come to the conclusion that the Egyptian troops facing the Southern Command were no longer deployed for defence, but had shifted to an offensive position. This was clearly contrary to earlier reactions to reports of a new deployment of the Egyptian army as being of minor importance and politically motivated. Yarif’s warning stunned Eshkol and became a dramatic game-changing factor of far reaching implications. Until then, the Israelis were convinced that the basic position of Egypt’s ground troops was a defensive one. This had given Jerusalem and the Israeli Defence Forces the reassurance that, if necessary, Syria could be dealt with militarily without risking supportive actions from the Egyptians in the south. It suddenly seemed that this assumption was no longer correct. As a result, Israel came to view itself as a country under threat from more than one side at the same time. It has been a small consolation that general Yarif later made his apologies and admitted that he had been wrong in his assessment of the Egyptian military posture at that critical moment. In the meantime, the harm had already been done. Yarif’s statement caused mayhem in Israel amongst the inner circle around Eshkol. For one, General Rabin, Eshkol’s top military advisor, almost instantly came to the conclusion that war was imminent. The first result of this rash opinion hit Rabin personally, as he suffered a nervous breakdown and became incommunicado to his colleagues for at least a day. (Several months after the end of the war, in an interview with French daily Le Monde (28 February 1968), chief of staff Rabin would declare: ‘I do not think Nasser wanted war. The two divisions he sent to the Sinai would not have been sufficient to launch an offense. He knew it and we knew it.’) His deputy, air force general Ezer Weizman, seeing his chances of becoming the next chief of staff enhanced, gave the order to mobilize the troops and tanks of the Southern Command without any visible hesitation or qualms, simply ‘to move units and divisions’, as he wrote later. By the end of May, things were looking rather grim for Israel. But in hindsight, with close examination of a number of facts that for one reason or another were not taken into account at the time, overlooked or suppressed, quite another picture emerges, one completely opposite from what the outside world was led to believe by the Israeli political and military elite. This is that Israel had to act first in order to escape defeat at the hands of its Arab neighbours. To begin with, the UNEF, the so-called buffer against hostilities between Israel and Egypt on the Egyptian side of the Gaza Strip, had been withdrawn as requested by Nasser. But the UNEF had been a sham all along and the only effect of its disappearance was to make it easier for the Israeli troops to move against the unsuspecting Egyptian forces in Gaza on the first day of the war, June 5.